Most of the coverage of the West Virginia mine murders quoted International Coal Group CEO Bennett Hatfield, who was on the scene. But its owner and “Non-Executive Chairman” is corporate takeover artist Wilbur L. Ross, Jr., who has bought up bankrupt firms in a variety of industries after they shed pension, health and/or other obligations to their workers. And after purchase, safety at these companies has nose-dived, thanks to the weakening or elimination of the unions, as well as nonenforcement of safety laws and regulations by state and federal authorities. Ross’s investment firm, W.L. Ross & Co., LLC, is located at 52nd and Lexington in Manhattan (an address we hope will soon be the site of protests). Some may see Ross’s story as one of a particularly avaricious man savaging the workforces of one industry after another. More accurately, however, it is a story of the system whose cyclical nature creates the need for men (and women) like Ross, who drive its component parts through inevitable reorganization required by the destruction of old, and the creation of new, capital (concentrating and centralizing it in the process). His operations have been variously called distressed investing or vulture investing, and Ross himself a bottom feeder. Indeed, he slashes jobs, wages, and benefits, but that is inevitable under capitalism — unless there is resistance. If his methods seem unusually rapacious, that’s because Ross serves the system at a particularly tumultuous time and in the most tumultuous places. 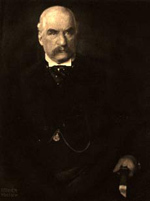 But then so did J.P. Morgan, the man who reorganized bankrupt railroads and in the process consolidated and centralized what was then the country’s most important industry. And so did John D. Rockefeller, who used dynamite and price-fixing, among other tactics, to build his empire, on his — and the US economy’s — way up to dominance. Ross got his start with Rothschild Inc., a global investment bank, spending 24 years there advising investors in handling their stakes in declining firms. Then on April Fools’ Day 2000, Ross took $450 million he had raised and formed his own company. Ross’s move came as a stock-market crash, 9/11, and a worldwide recession was sending scores of companies into bankruptcy. These companies included not only “New Economy” firms such as Enron, WorldCom, and Global Crossing, but also older manufacturing firms. Ross’s tactic of choice was use of Chapter 11, which is the US corporate mechanism for organizing the process of corporate consolidation, allowing companies to walk away from their debt and obligations. Ross, who runs two hedge funds and draws capital from private equity funds, has also found investment capital sources in big institutional investors such as the State of Wisconsin Investment Board, which has more than $225 million invested with him. He takes short positions in companies he thinks are headed for bankruptcy, profiting as their stocks decline, and buys assets straight out of bankruptcy court. The business press reports that he specializes in quick entries and exits, usually a matter of years at most, and often sells the newly-reorganized businesses to larger, healthier rivals. Said Business Week: “His fund agreements with investors cover a seven-year period: four to invest, three to liquidate investments.” In short, however much he profits as an individual, he also acts as an agent for larger, established players in the economy. Since 1998, some 30 U.S. steel companies have filed for bankruptcy, citing excess global capacity and the resulting aggressive global competition. The blame, however, was of course put on allegedly high labor costs and so-called “legacy” obligations — health-care, insurance, and pension benefits. Ross — like already-existing steel company owners — sought to solve this crisis by cutting such costs and obligations. Ross’s unique contribution was to do so at the most financially-challenged firms. His first big move was his February 2002 purchase of bankrupt LTV Corp, waiting until LTV had shed its health-care liabilities and dumped its pension obligations on the Pension Benefit Guaranty Corp. Ross paid $90 million in cash and took on $235 million in assumed liabilities — in return, he gained assets worth $2.5 billion. LTV became part of Ross’s International Steel Group. After replacing defined benefit pensions with 401(k)s, Ross instituted an incentive pay program in which workers got paid more for beating production goals. The ISG cut man-hours of labor per ton of steel from two-and-a-half to one, a saving equaling $45 on a ton of steel selling for $300. Because Ross had “saved” steelworker jobs — even though their pay and benefits had been slashed — USWA President Leo W. Gerard said the investor was “a breath of fresh air. Wilbur and his people actually cared about what we had to say.” Apparently, all it takes to make a union bureaucrat happy these days is a friendly capitalist ear. Next he bought out Bethlehem Steel, having shorted its stock for a year before the company’s bankruptcy. Bethlehem too terminated health benefits and dumped its pensions on the PBGC. Its former CEO claimed “no other solution was possible for Bethlehem because that’s what [USWA President] Leo [Gerard] wanted.” Work rules were changed and jobs cut as well. This acquisition made ISG the second-largest integrated steelmaker, behind U.S. Steel, and ISG’s “flexible union contract” at its various properties was emulated at U.S. Steel. (U.S. Steel cut off 35,000 retirees and dependents from benefits when it took over bankrupt National Steel.) 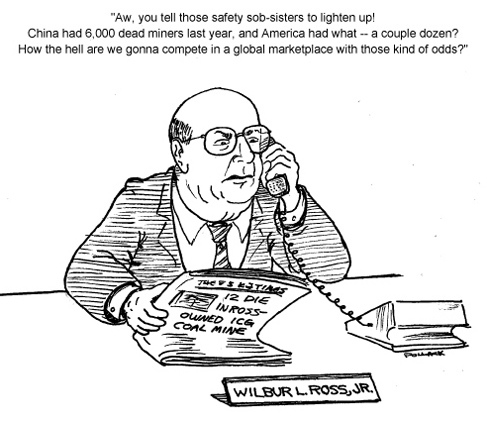 Later, Ross also bought bankrupt Weirton Steel and sold an entire former LTV steel mill and shipped it to China. The man who set up Bethlehem for Ross’s picking, by the way, was its CEO, Robert Miller — the man who now heads the Delphi auto parts company. Delphi is currently being eyed by Ross for a possible takeover, a takeover made attractive because Miller is trying to cut Delphi workers’ pay by 2/3 and slash benefits and jobs even more harshly than he had done at Bethlehem. Ross has already gotten a start in this pursuit by having his new International Auto Components Group buy up bank debt and bid on assets of other ailing auto parts firms. Ross himself points to the thanks he owes to systemwide processes, telling the media that he is able to snap up auto parts firms because of consolidation among the big auto manufacturers — companies which no one could accuse of being run by unusual or abnormal corporate vultures, but are rather at the core of US industry and its normal cyclical vicissitudes. Ross’s steel purchases also profited from the tariffs on steel imports Bush had imposed while seeking votes in rust belt states. But Ross himself has long been a major donor to Democratic Party candidates. He was a major fund-raiser for Bill Clinton, and he is friends with John Kerry. He had also briefly funded the Democratic campaign of his (now ex-) wife Betsy McCaughey against Governor George E. Pataki. And in his pro-tariff lobbying, he has allied with both corporate and union heads — the latter all solid Democrats. Trying to further promote the perception of Ross as the saviour of steel jobs, and to further their alliance against imports, Gerard invited him to speak at a steelworker rally in Miami which coincided with massive union and environmentalist protests against the Free Trade Agreement of the Americas. In 2002, Ross sold ISG to Indian steel magnate Lakshmi Mittal for $4.5 billion in cash and stock — fourteen times his initial investment after just two years. Ross himself made $260 million, with the rest going to his partners and ISG stockholders. In addition to his usual slashing of costs (operating costs for ITG are 25% less than its competitors), Ross’s reorganizing efforts in textile have an interesting twist. He is combining the manufacture of cloth with the traditionally separate process of producing finished goods (apparel and home furnishings). Up until now, we’ve talked mostly about concentration, i.e., the shrinking number of firms through mergers. Here Ross is pursuing centralization, i.e. the growth of a particular firm, especially through vertical integration, as previous boundaries between suppliers and customers drop (as was done in steel’s first heyday when coal and other raw material suppliers were bought up by steel producers). Another twist in his textile strategy is his opposition to the kind of tariffs he backs in steel, because rather than relying primarily on cutting domestic labor costs – although this has been important – his newly-acquired US-based firms are also investing heavily abroad, including Central America and China. This shows the one-sided and futile nature of the protectionist panaceas promoted by the labor officialdom. ITG is now the largest U.S. uniform maker, producing uniforms for cops, hotel and airline workers, and the military. After textile, Ross turned his sights on coal, buying bankrupt Horizon Natural Resources and forming the International Coal Group (ICG). Horizon’s pension plan, which had an $87 million deficit, was assumed in 2004 by the PBGC. His partner in the purchase was Massey Energy, formerly A.T. Massey Coal. Massey has a long, sorry history of busting unions, and was the scene of a long bitter and losing strike in 1984 by the UMWA. All of Massey’s mines are now nonunion. On August 6, 2004, a bankruptcy court judge voided Horizon’s labor contracts and allowed them to cancel healthcare benefits for some 800 active Horizon miners and some 2,300 Horizon retirees; as in steel and textile, only then were the company’s assets sold to Ross and Massey. In this case the judge wasn’t just approving termination of a private corporate plan: he ruled Ross was not bound by the Coal Act, a federal statute designed to protect health care for miners who retired prior to October 1, 1994. Most retirees were thrown back on the union’s health plans, which, having lost hundreds of thousands of members in recent decades, could ill afford to take them on. A UMWA press release reported: “After hearing the judge’s decision, Horizon lawyers and lawyers for the entities who will soon own the bankrupt coal operator’s properties [i.e. Ross and Massey], began laughing and high-fiving each other — all knowing full well that the ruling meant that thousands of Horizon retirees and active coal miners, many suffering from chronic, high-cost medical problems like black lung disease, would soon be without promised health-care benefits and job rights.” At the time there was a flurry of media reporting on the cancellation of these benefits and the legal challenges to them, but Ross’s role was little noted, and the story was soon lost in the welter of reporting of similar catastrophes facing airline and then autoworkers. In this sense Ross became for the media — accurately, I would add — just a bit player in the larger, systemwide assault on workers then picking up speed (and with Delphi now reaching dramatically new proportions). The judge also ruled anyone buying Horizon assets was “free and clear” of any and all union contract obligations. And once again, Ross and Massey only bought the physical assets of the mine so as to avoid obligations to the workers. After the Horizon purchase, ICG acquired the Sago Mine, where the miners were murdered this week, when it bought the Anker Coal Group, part of a broader reconcentration of the industry. ICG is now the nation’s fifth-largest coal company. And while the particular firms he snapped up have been ailing, Ross is taking advantage of an upswing in the industry’s fortunes. In steel, despite the decline of large US manufacturers (relative to foreign manufacturers and domestic minimills), and global overcapacity, there are still huge profits to be made, for instance in sales to rapidly-expanding economies such as that of China. Says the San Francisco Chronicle, “Driven by China’s voracious appetite for imported steel, buoyed by a booming construction market at home and braced by U.S. tariffs on some imported steel, the U.S. steel industry has been on a fast run lately.” A similar process has gone on in coal. After decades of decline, followed by concentration and centralization, world demand for coal is invigorating those firms best positioned by that reorganization to move most quickly and strongly to take advantage of it. When Ross began his move into coal, prices for Central Appalachian coal were increasing by two-thirds and coal prices in general were at an all-time high — driven in part by the steel expansion just noted. Demand for U.S. coal rose about 3 percent in 2004 and 2005, compared to previous, longer-term growth rates of 1.5 percent to 2 percent. This growth came in part from a partial revival in manufacturing; the fact that nuclear power plants are operating at near capacity; and spiking oil and natural gas prices. And the weaker U.S. dollar has stimulated demand overseas for coal. And even hiring is picking up again after decades during which the mining workforce shrunk from hundreds of thousands to just tens of thousands. While safety in steel suffered in the firms he purchased, the process has been most glaring — and deadly — in coal. And the safety decline is directly connected to Ross’s desire to reorganize his new firms in order to maximize profits upon exit. The firms at the center of the industry throughout its history, including those owned by the most important firms, have always avoided safety spending like the plague, taking safety precautions only when forced to do so by strong unions, and by government regulation which itself only came about because of union pressure. So Ross’s actions here only highlight an always-present pattern, but a pattern which has a particularly deadly consequence now because we are on the cusp of an industry shakeout. I haven’t exhausted the list of Ross’s ventures. He has invested millions in telecommunications. He’s also getting ready to make a move into Europe, which is undergoing a continent-wide version of the concentration and centralization mentioned above. In this case, it’s facilitated by the creation of the European Union, which has mandated by legislation the kind of firm-by-firm union-busting, job, wage and pension slashing Ross and others in the US have engaged in. “Europe is getting ready to blow up,” says Ross, and he is eagerly eyeing investment opportunities provided by EU-sponsored cross-border industry consolidation. Once again, his particular vulture-like behavior is facilitated by far broader institutional and system-wide processes. A New York Times editorial on the deaths said, “Just as Hurricane Katrina forced Americans to look at the face of lingering poverty and racism, this mining tragedy should focus us all on another forgotten, mistreated corner of society.” But without a massive reaction by workers around the country, the response to the mining murders will be every bit as inconsequential as that following Katrina. Despite an initial flurry of feigned outrage by politicians, little has been done for the hurricane’s victims — although the region’s people are still organizing to turn that around. And the same lack of change will be the case in coal, and the other industries in which Ross has stuck his grubby hands, unless there is a mass, organized response by workers. That’s the spirit showed recently by Taylor Law-defying transit workers in New York, and that’s the kind of spirit needed to stop the crimes of thugs like Wilbur Ross. And a real movement based on that kind of spirit can foster a discussion about how to address the broader systemic problems of which Ross is just a particularly vicious symptom. Such a discussion would address the need for new forms of international solidarity. The day after the Miami USW forum described above at which Ross spoke, one of his brutalized employees, who had lost his pension after 30 years at Bethlehem Steel, told a workers’ forum of the need for cross-border solidarity among steelworkers. It would also include discussion of how to fight for universal, full, and free pension and healthcare benefits — issues raised by UMWA head Cecil Roberts during Ross’s coal takeover. A cross-industry fight on such benefits should have begun long ago given their disappearance or threatened termination in virtually every industry in both the private and public sectors of the economy. The New York Times editorial noted that “Political figures from both parties have long defended and profited from ties to the coal industry.” Indeed, Democrat-donor Ross disproves the notion that it is only Republican unionbusters causing our woes. So I’ll note in conclusion that a new fighting spirit would also draw new forces to the Labor Party (which is just now taking its first electoral steps), a party formed precisely in order to launch struggles over just such society-wide problems.